Below are my top ten suggestions for an unforgettable outdoor aperitivo in Rome. Up/Sunset Bar is perched on the very highest floor of the new super-luxe Rinascente department store. Towering eight stories above the city (yes, that’s a skyscraper by Roman standards), this lush space is littered with low lights, plants, and even little patches of grass, so guests feel like they’re relaxing in a garden floating above the city. Via del Tritone, 61. Pro: Without a doubt, the view of Borromini's stunning baroque bell tower on nearby Sant'Andrea delle Fratte church. Con: On weekends, this place can be crowded to the point of miserable. A narrow staircase is the only access from the restaurant on the top floor to the rooftop terrace above. Crowds of shoppers and would-be diners (if they're lucky enough to grab a table) can clog the staircase to a stand-still. For an aperitivo that promises full-on glamour, there’s no better place than Zuma, located on the rooftop of the historic Fendi building off uber-chic Via Condotti. The cocktails are inventive and many are made with sake, a nod to the pan-Asian theme of the attached restaurant. Via della Fontanella di Borghese, 48. 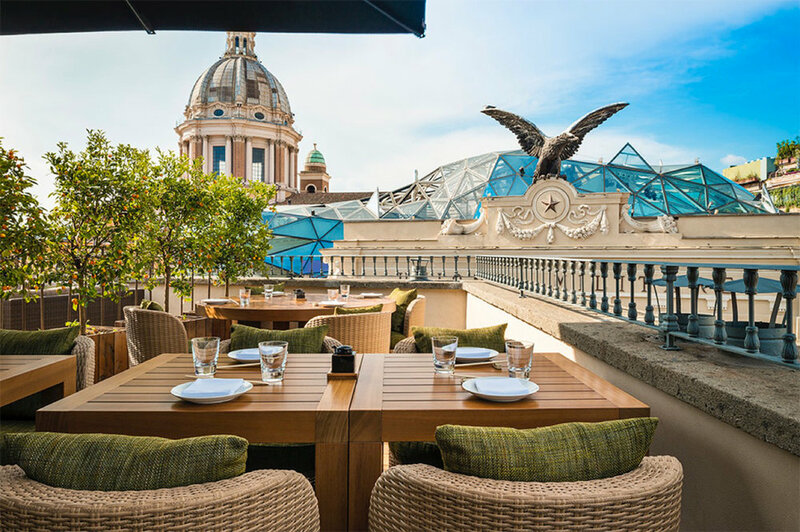 Pro: With a view of La Lanterna's distinctive glass ceiling next door, as well as the rooftops and domes you'd expect from the Roman skyline, the setting is truly one-of-a-kind, even for Rome. Con: This place is decidedly posh, and while that might not be a con for you, keep in mind there's a strict dress code. Men without jackets and women in flip-flops will be given the stink-eye...if not turned away at the door. Located in the once-industrial but now-trendy Ostiense district, T-Bar is a spacious locale with a large terrace overlooking the Tiber. Attracting a youngish, professional, straight-from-the-office set, the bar offers generous platters of tempting snacks and a view of the Gazometro in the distance. Via Ostiense, 182a. Pro: The bar is located quite a ways downriver, where, unlike in the rest of the city, there are no river embankments. The grassy banks let you image what the Tiber must have looked like pre-1870s when the city sloped down to meet the river. Con: Can't really think of one, to be honest. I love Terrazza San Pancrazio for its location. It doesn't have an amazing view like the other rooftop places on this list, although it is, technically, a rooftop bar. No, what I love is that its just a couple blocks up along Via Garibaldi from where I lived during some of my happiest years in Rome. My now-husband and I used to walk past this place every Sunday on our way to and from Villa Pamphilj, and although we never went here at that time (I don't think it existed then), the setting nevertheless takes me back to that period in my life. Via di Porta San Pancrazio, 32a. Pro: Instead of serving a classic aperitivo buffet of rice salad and cold pasta, they serve sushi! Con: No other way to describe the service but rude. They once lost my reservation ON MY BIRTHDAY and had the gall to insist I had never made one. Luckily I had asked the name of the person I talked to, and I basically bullied them into giving us a table. Needless to say, I haven't been back. The Vatican's best kept secret, Residenza Paolo VI is a boutique hotel converted from an Augustinian monastery. 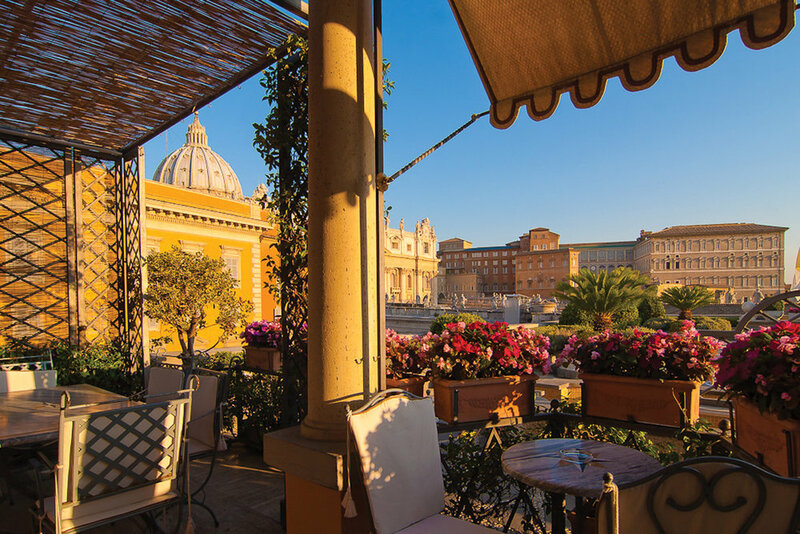 It's the only hotel located cheek-by-jowl with St. Peter's Square, and it's so close in fact that guests on the terrace café have the impression of being seated on top of the colonnade itself. Via Paolo VI, 29. Pro: A few hours before aperitivo hour, they offer full afternoon tea with a wide selection of quality blends, cakes, tea sandwiches, and cute little triple-decker platters of mini-pastries. It's all very civilized. Con: The background music they play is sacred hymns, and with the dome of St. Peter's Basilica dominating the scene, it can be a bit of overkill. Picture an Art Nouveau greenhouse furnished with plush velvet couches, rows and rows of books, long, elegantly laid tables, and lush hanging plants, flanked by a delightful patio dotted here and there with cozy gazebos. This is the Marco Martini Cocktail Bar at The Corner Townhouse on the Aventine Hill. Viale Aventino, 151. Pro: Come for the cocktails, expertly crafted by the barman (and the bar's namesake). Con: The huge ugly FAO building in the distance mars the picturesque atmosphere, although that's hardly their fault. Ever looked up at a towering Italian church and wondered what it would be like to see the view from up there…and grab a drink while you’re at it? Well, now’s your chance. Terrazza Borromini is a new rooftop bar and restaurant perched on top of Borromini’s spectacular church, Sant’Agnese in Agone. Via dell’Anima, 30. Pro: Besides the sheer caché of drinking on the roof of a church, a few of the tables even have a view straight down into Piazza Navona. Con: The service leaves a lot to be desired. The first time I came here, I was informed that it opened for aperitivo one hour AFTER the time of my reservation. To their credit, they did offer to seat us, but as the entire terrace was half a foot deep with soapy water, we opted to go elsewhere. I don't like to use this word often, but Mò Mò Republic is special. Located in leafy Monteverde, this vast bar and restaurant is housed in a stunning turn-of-the-century mansion, replete with grounds and a swimming pool. 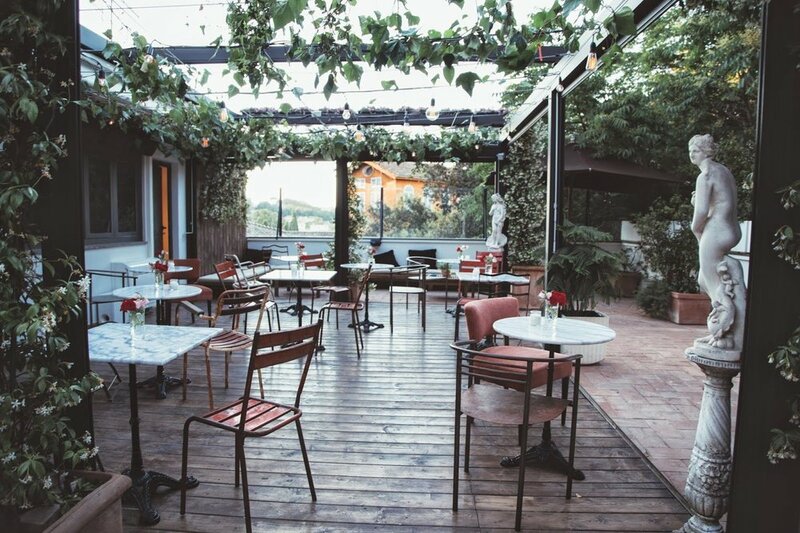 Aperitivo here is dreamy yet fun at the same time, with cozy lounging areas and even teepees set up on the lawn, where you can curl up for a tête-à-tête with your favorite person. Piazza Carlo Forlanini, 10. Pro: Keep your eyes peeled for bunnies (yes, bunnies). They run wild all over the spacious grounds, and some are even tame enough to let you snap a selfie with them. Con: In case you decide to stay for dinner (and you should definitely stay for dinner), whatever you do, don't order the pizza. Just trust me on this. A former industrial-era wool mill, Lanificio is now an enormous space that hosts a restaurant, bar, and nightclub. 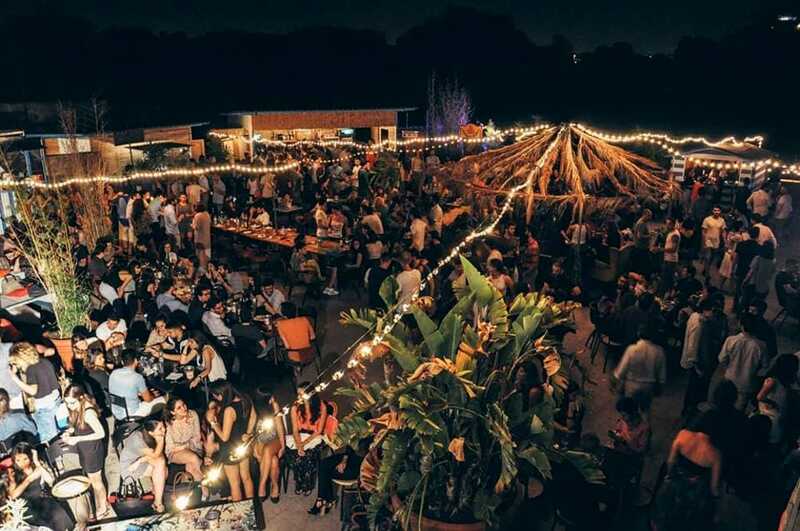 The main draw is the massive open-air terrace strung with fairy lights and full of large communal tables that invite new acquaintances. Pro: Because it's located far from the center, it's virtually void of tourists, which makes it a great place to get a feel for the genuine nightlife of the city. Con: Ironically, its location is both the pro and the con. Although the space itself is charming, it's a bit of a trek to get to, especially for non-locals who don't have their own wheels. I have a special place in my heart for the rooftop terrace of Grand Hotel de la Minerve because my husband took me here in the very first months of our relationship. The drinks are sublime (even if, to me, the only thing appropriate to order here is Champagne) and it's so close to the Pantheon, you almost feel you could reach out and touch it. Piazza della Minerva, 69. Pro: From a certain angle, three of Rome's most glorious churches line up, St. Peter's, Sant'Ivo alla Sapienza, and Sant'Andrea della Valle. It makes for a postcard-worthy shot. Con: It's a hotel, and no matter how lovely it is, there's always something a little sterile about a hotel. Have you tried any of these places? Which are your favorites? Are there other great spots I failed to mention? Leave your comments below.